So, my question for today is: how have the physical attributes of ballplayers changed over the years? Let's look at this graphically. I'm reporting all dates as birth year, as that seemed a logical way of organization players. I'm also throwing out the edges of the database that contain fewer than 50 players per birth year. That means, for recent years, I'm not including anyone born after 1990 (i.e. 24 years old in 2014). We can see that, after an initial surge of the extremely short in late-1880's ball as baseball became more professional and required players to be top athletes, average player height quickly reached 70 inches (5'10", aka jinaz-standard height) and then progressively have gotten taller, on average, as a group. Currently, baseball players average just shy of 74" (6'2"). Furthermore, major league baseball players tend to be taller than the average population. Current average height is 5'10", while ballplayers today average 6'2". Among those born in the 1920's, average height was around 170 cm on this graph (67", or 5'7"), while baseball players.averaged 5'10". 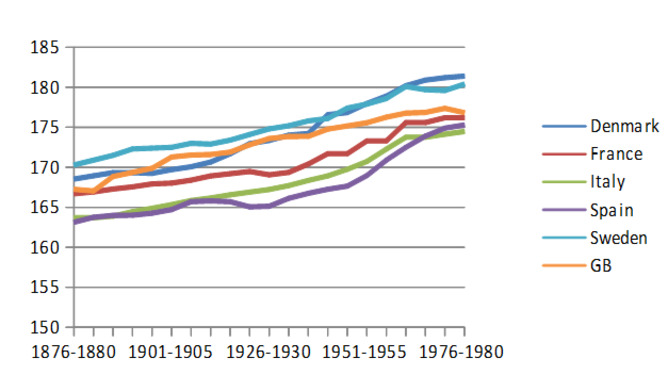 So, we have a steady increase to 1920, then a slight increase that follows height...and then BOOM, something happens. Weight shoots from 188 lbs to 206 lbs in a matter of 13 years (1965-1979 birth years). That corresponds to players who played their age-27 years between 1992 and 2006. What gives? So here, we're seeing a metric that tracks both height and weight in the same number. And again, we're seeing a steady drop in BMI as the game becomes professional, a flat-lined BMI for many decades, and then a spike again once we hit 1965 babies. The knee-jerk reaction is to claim that this matches up pretty well with the PED era. There are no clear fenceposts for when that era began and ended, but I tend to think of the steroid era running from around 1994 (the year of The Strike) until the advent of MLB's testing program in 2003. The steep part of the slope begins and ends, more or less, with players who peaked during that period of time (1992 through 2006). The interesting thing is that it hasn't really dropped that much since MLB started its testing program. 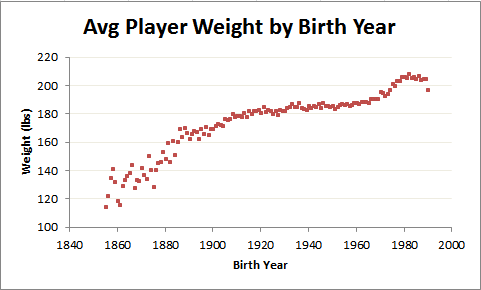 Average weight of players has decreased slightly since its peak in 1982 babies (208.7 lbs) through 1989 babies (205 lbs). Height has also dropped slightly during that time (0.3 inches), so BMI changes very little in that time. That span describes players who are currently ages 25-33. These are players that, by and large, have played their careers during a setting in which drug testing was a thing. And yet, while they've declined, we're a far cry from where we might expect to be before that spike. If the spike in weight and BMI occurred due to steroids taking over the game, and if the current testing program works well enough that steroids are now largely NOT a part of the game, we'd predict weight and BMI to return to pre-steroid levels. A shift in training regimes of players: an emphasis on being bigger, stronger, and faster through weight lifting and nutrition...and for scouts to prefer bigger players. An influx of international talent (including lots of big guys) that push up the pool of available talent. If you have more players available to choose from, and baseball favors larger humans, you'll be able to shift up the averages by casting a larger net when selecting players.